The date of May 30th 1987 is one I’ll probably never forget. It’s not that I’m the world’s biggest Stryper fanboy or anything because there are probably four or five people in front of me in that particular queue, but the date of Stryper’s one and only UK gig at the Hammy O has come up so many times in conversation that I’m hardly likely to forget it. For reasons best known to the band themselves they never came back, although a Michael Sweet-less trio did confirm and then cancel an appearance at the Greenbelt Christian festival a few years later, which puts them somewhere behind Boston, Kansas and even Night Ranger when you tot up the UK gig count. Thankfully this unexpected jaunt across Europe included a stop-off at our fair capital, and with an eleventh hour inclusion of original bassist Tim Gaines in preference to Tracy Ferrie it was the original line-up that took the stage. Sporting less yellow and more black than previously, the twin guitars of Oz Fox and Michael Sweet get the party underway with the instantly familiar riff to ‘Soldiers Under Command’, Sweet nailing the high notes and Fox and Gaines reminding us how good the harmonies have always been in this band. I think it’s fair to say that Stryper have weathered considerably better than most of their ilk, both physically and in the high standard of their performance, and with drummer… er, sorry, ‘visual timekeeper’ Robert Sweet flailing away from his familiar side-on position, the band certainly seem to have lost none of their dynamic edge. They show early confidence in their new material with the title-track of their latest album ‘Murder By Pride’, followed by early metal anthems like ‘Loud & Clear’ and the superb twin-guitar attack of ‘The Rock That Makes Me Roll’, both with Sweet and Fox riffing and soloing with jaw-dropping precision. The pace rarely drops throughout their ninety minute set with mid-paced commercial rockers like ‘Reach Out’, ‘Free’ and ‘Calling On You’ being as sedate as it gets, and the bible throwing was so brief you could easily have missed it. It’s not surprising given Michael’s current position as Boston’s singer that they trot out an amazing version of ‘Peace Of Mind’, but probably the most unexpected moment was their version of Judas Priest’s ‘Breaking The Law’ that preceded it, and great it was too. Other new songs like ‘4 Leaf Clover’ and the ‘new’ version of ‘My Love I’ll Always Show’ were aired alongside ‘Open Your Eyes’ from ‘Reborn’ and the brilliant ‘All For One’ from ‘Against The Law’, the latter with Jeff Scott Soto loudly re-creating his original backing vocals from behind my right shoulder. The set proper closes with the high-energy riffing of ‘The Way’ and the band return with the layered harmonies of ‘Sing-Along Song’ and an inevitable ‘To Hell With The Devil’, with Sweet easily nailing the screams, the crowd singing the words and giant yellow balloons bouncing around the venue. This show had been a long time coming, but it’s heartening after so many disappointing shows by some of our 80’s heroes (naming no names!) 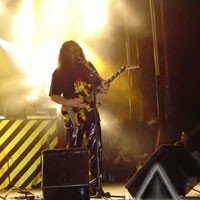 that Stryper still have every weapon in their armoury fully loaded. Even my Fireworks companion for the evening - the slightly sceptical Monica Castedo-Lopez - was impressed with their performance. Lets hope we all live long enough to see their next UK show.